A Grain Free complete food for all neutered cats. Sterilized has a lower content and different composition of some minerals to reduce the risk of crystallization in the bladder. There is an optimum pH for struvite prevention. 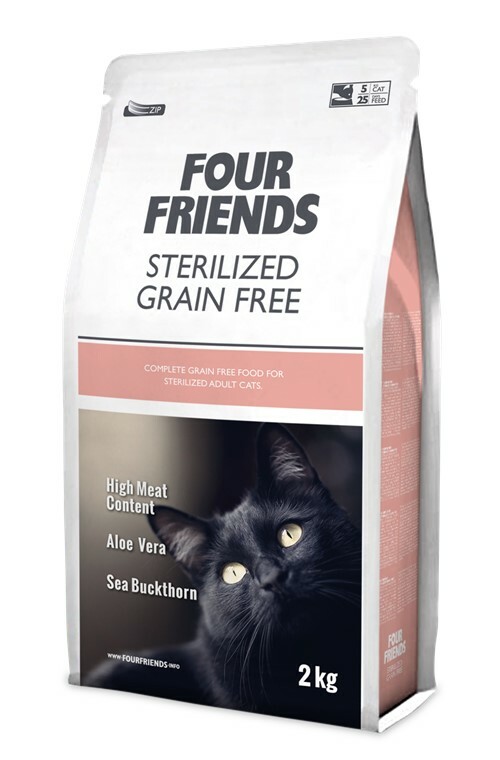 An addition of mannan-oligosaccharides and fructo-oligosaccharides in the whole FourFriends range acts as prebiotics to maintain your cats intestinal flora and keep it in top shape. Starting at only £4.00 for a 300g bag, a 2kg bag costs £13.50, a 6kg bag is £33.98 and a bundle of two 6kg bags is only £54.99. FourFriends Sterilized gives excellent value. Remember you earn Loyalty Points on each purchase.